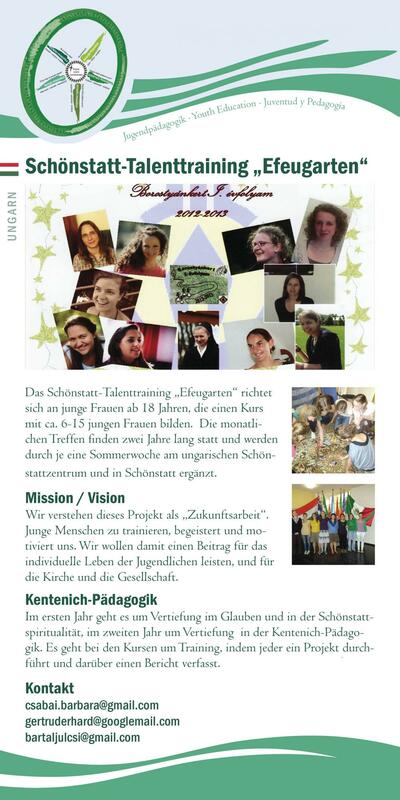 The development of talents in Schoenstatt - “Ivy Garden” - is a course geared towards young women over the age of 18 who want to develop their leadership styles. The course brings together a group of 6-15 women over a period of about two years. They meet on weekends at the Schoenstatt centre in Hungary, and the course ends with a week in the summer in Schoenstatt, Germany. We see this course as a “project for the future”. This motivates and inspires us to train young people. We not only want to provide a contribution to the individual lives of the youth, but also to the Church and society. The first year of the course is aimed at deepening their faith and Schoenstatt spirituality, and the second year focuses on Father Kentenich‘s pedagogy. If possible, we would like to provide continuity by creating a new course to follow on from the first in order to bolster many women‘s leadership qualities.